Diatomaceous Earth filtration systems create high quality-low cost drinking water. They are especially effective at removing cysts, algae, and asbestos from water with turbidity levels below 10 NTU. The Westfall DE Filter has provided extended economical corrosion-free operation at sites around the world for more than 50 years. DE filtration is currently one of the U.S. Environmental Protection Agency’s (EPA) approved technologies for meeting the requirements of the Surface Water Treatment Rule (SWTR). Two new filter installation were recently put on-line at a water treatment facility in California, bringing the plant’s total number of Westfall units up to an even dozen. Westfall maintains an inventory of DE Filter sleeves and other replacement products. The raw or process water is drawn through the filter and pumped into the system by the filter pump. Piping is arranged so that the water can be recirculated via a by-pass line for the purpose of precoating the elements prior to the actual filtration process. 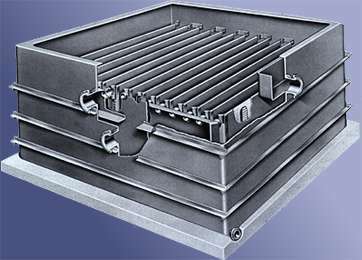 Precoating is accomplished by introducing the suitable amount of diatomaceous earth powder into the filter tank and recirculating the mixture until the filter elements are uniformly coated and the water in the tank becomes clear. 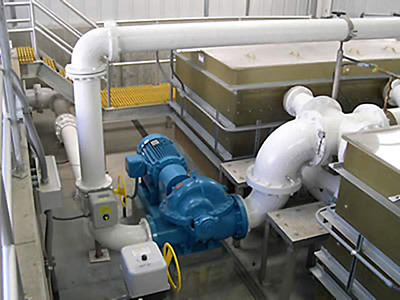 Water from the discharge side of the filter pump is then directed through main effluent pipes and into the finished water clearwell, or returned to the process. As the DE Filter run progresses and the suspended solids are removed, the differential across the cake will gradually increase until it reaches 15 inches of mercury.